Natural measures to reduce flood risk, which include the planting of thousands of trees in the River Aire catchment, will be on show in Skipton this week. From left, Cllr David Whipp of Pendle Borough Council, Cllr Michael Ellis of Bradford Council, Cllr Judith Blake of Leeds City Council, Adrian Gill, flood risk manager at the Environment Agency, and Louise Farnell of Yorkshire Wildlife Trust, plant trees at the first pilot site at Gargrave, near Skipton. A team from the Environment Agency, who are leading the pilot as part of the Leeds Flood Alleviation Scheme, will be at the Upper Aire Land Management Project event at Skipton Auction Mart on Wednesday 23 May, looking to meet local farmers and landowners to seek out potential new pilot sites to trial the techniques. Working with natural processes to reduce flood risk, known as natural flood management (NFM), is an important part of managing and reducing flood risk in a sustainable way alongside more traditional engineering solutions. The team is hoping to build on the existing work done in the catchment by Yorkshire Wildlife Trust and others, working with farmers to seek further potential sites in the upper Aire catchment to test natural flood management techniques like tree and hedgerow planting, leaky barriers and brash dams to help slow down the flow of water during a flood. The interventions also create habitat for wildlife and help regenerate rural and urban areas through tourism. The natural flood management pilots form part of the Leeds Flood Alleviation Scheme, led by Leeds City Council in partnership with the Environment Agency, which has a catchment wide approach to reducing flood risk to Leeds. This £500,000 pilot programme forms part of plans to plant hundreds of thousands of trees that will support second phase of the Leeds Flood Alleviation Scheme. Having started the Upper Aire tree planting in March, it is vital we work with as many farmers, landowners and stakeholders as possible as only through a partnership approach will we be able to achieve our united goal of protecting all our communities along the River Aire catchment from the risk of flooding. A lot has been achieved already through the Leeds Flood Alleviation Scheme, but we know much more needs to be done requiring significant investment in a range of measures to put in place everything we can to avoid a repeat of the devastation of the Christmas floods of 2015 to our city and region. The Environment Agency is committed to reducing flood risk and improving the environment for people and wildlife. The natural flood management pilot we are leading in the Aire catchment provides us with a fantastic opportunity to work with famers and landowners to secure potential sites to trial new techniques and develop future plans for the catchment. The pilot sites will enable the team to test a range of monitoring techniques and start to build and gather an evidence base to increase their understanding on the benefits of NFM in reducing flood risk. The pilot programme is being used by the Environment Agency and Leeds City Council to develop a co-design approach to working with landowners, tenants, local authorities and other key partners such as the Yorkshire Wildlife Trust and the White Rose Forest. This will help to then develop future plans for the catchment. The first of thousands of trees to be planted across the upper River Aire catchment took place on the 20th March, as part of the pilot natural flood management project. 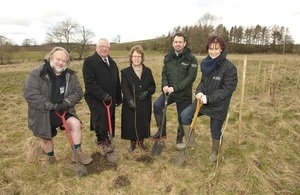 Cllr Judith Blake CBE, leader of Leeds City Council, planted the first tree on site at Eshton Beck, Gargrave, witnessed by volunteers, landowners, local authorities and partners. The site now has 450 trees planted, and will play an important role in seeing how natural techniques can slow the flow of water and reduce the risk of flooding downstream. Following the successful opening of the £50million first phase of the scheme serving the city centre, Holbeck and Woodlesford in October last year, phase two identifies measures further upstream including the Kirkstall corridor which was badly hit by the 2015 Christmas floods. It also looks at areas beyond the city boundary to further reduce the possibility of the river flooding in Leeds, as well as additional measures to offer protection for the South Bank area of the city centre which is a key future economic driver for Leeds. Phase two is taking a catchment wide approach to reducing flood risk to Leeds through the implementation of natural flood management measures, proposals to create new woodland areas could more than double the canopy coverage throughout the River Aire catchment. Proposals also include a flood storage areas and the removal of existing obstructions along the river to improve capacity in the river. Hard flood defences will also be used and will take the form of walls, embankments, landscaping and terracing. An outline business case for phase 2 has been completed, which was submitted at the end of January 2018. Outline design for engineered options is being progressed, which will be followed by a tender process with an aim to awarding the construction contract award in autumn 2018.